The composer Tancredo Pavone is sure of his quest: “The centre of the sound is the heart of the sound. One must always strive to reach the heart of the sound ... If one can reach that one is a true musician. Otherwise one is an artisan.” He compares himself to Indian sādhus, itinerant monks who make pilgrimages to holy sites by rolling all the way, often thousands of miles: “It did not matter to them how long it took to reach their destination. It did not matter if it took them a year or five years or a whole lifetime. They took the cloth from around their shoulders and held it in their hands stretched out above their heads as they rolled to stop themselves falling into ditches. It gave them equilibrium.” Composing music is then an impersonal demand, a spiritual endeavour, a life’s journey, anything but a career. Pavone’s journey began in the early years of the 20th Century when he beat a piano with his fists and feet, continuing when his aristocratic parents declined to stop him. This is real musicianship, he announces, not notes and counterpoint but “the patrimony of hands and feet”. As a young man free from the need to earn a living he moved to Monte Carlo, dancing, romancing and writing waltzes, before moving on to other cities: “London was where I experimented with women and Vienna was where I experimented with notes”. In Vienna he studied composition and discovered that “thinking is the worst thing for a musician”. He says Schoenberg, who thought he had advanced the cause of German music by a hundred years, was a disaster for music: “the language of music is not the sonata and it is not the tone row ... it is the same kind of language as weeping, sobbing, shrieking and laughing”. Perhaps this indicates Pavone hasn't grown up, or has grown up but recognises what has been lost as a result. If so, that doesn't undermine what he says but strangely enhances our engagement, as if he's onto something. as if at every moment you are going either to be crushed or swept away, but you also feel as if you are in touch with the secret pulse of the universe. It is an extraordinary sensation ... a compressing into the moment of everything that has ever been and ever will be. It is this that I look for in each sound I imagine ... it is this that is at the heart of every note. The same occurs when he listens to great trumpets played in a temple in Nepal. To cynical Western ears it sounds like Pavone is off his trolley, and he did indeed spend the Second World War with his wife in a sanatorium in Switzerland – “I thought, Europe is a madhouse, so the only way to stay sane is to enter a madhouse”. Still seeking the heart of the note, he sat at his piano and hit the same key over and over, eventually completing a piece called Six Sixty-Six in which the pianist has to play the same note with the same intensity six hundred and sixty-six times: “The world is there to be transformed. The human being is there to be transformed. When a note is played 600 and 66 times, it is transformed.” His wife left him. Massimo is an artisan, Pavone’s manservant. He manages Pavone’s household, he chauffeurs him around the Italian countryside and cleans and presses each one of his one hundred suits even if it had been worn only once. He is also the only other person allowed in his study and, as a result, becomes Pavone’s captive audience. Massimo’s dedication is such that he is apparently able to remember each of Pavone’s monologues, even if he has no interest in or knowledge of their subject. 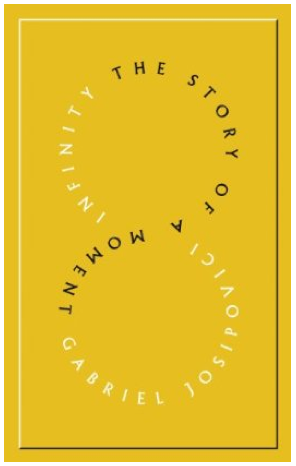 Infinity: The Story of a Moment comprises transcripts of Massimo’s answers to an interviewer’s questions about the late composer, beginning with awkward silences and patient prompting, then soaring to trace the arc of his master’s remarkable life. Our music has ... returned to its ancient roots. It has escaped from the puerile imitation of sexual congress, caress arousal, delay, frenzy, extinction, which was the pattern of Romantic music and the reason for its enormous popularity among the repressed middle classes of Germany and Austria, who imagined that it was leading them up to an aesthetic heaven. Well, he said, they had their climax twice over, first in the First World War and then in the Second World War. That should have been enough for them. But not at all. Look at their books. Look at the music they flock to listen to in the concert halls, this so-called intellectual elite. Caress, arousal, delay, frenzy, extinction. All the same. No change. One cannot think one's way through artistic problems, he said, one has to go about it in a different way. Bach did not think, he said, he danced. Mozart did not think, he sang. Stravinsky did not think, he prayed. Pavone did not think then, he listened. But Infinity should not be limited to a repository of wisdom about art. The form is its wisdom. The author does not seek to assert a resolution but calmly follows the course of a life, allowing a space to be cleared in which that life can be seen and felt as one moment, with the individual’s failings as prominent and as vital as his triumphs. There is also the moment of Massimo's interview quietly revealing that the gifts of patience and dedication are affordable in all walks of life. Infinity is a literary production in the spirit of Pavone the artist, Massimo the artisan and his unnamed interviewer. One last time Massimo drives Pavone into the Roman countryside and places him wrapped in a blanket at the edge of a wood to listen to the cicadas. He tells Massimo how their song is as powerful as any noise emerging from a Buddhist temple in Nepal or Tibet. What is it saying? Now, it is saying, and eternity. If you can hear the now, he said, you can hear eternity. That is what I have tried to do, he said, to write a music of now which would be a music of eternity. Then he was silent for a long time. 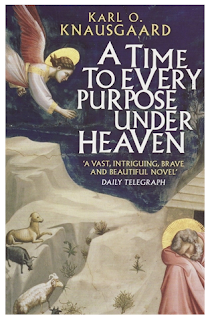 Before I had even finished Karl Ove Knausgaard's My Struggle, I had ordered a copy of his 2008 novel A Time to Every Purpose Under Heaven, an act more to do with wanting to remain in his company once the first was read than curiosity about what a novel by the author of a six-volume autobiography was like. The good news is that A Time to Every Purpose Under Heaven fascinates like My Struggle. There is no bad news. The novel begins in 1551 when late at night by a stream in a forest an 11-year-old boy Antinous Bellori stumbles upon two angels eating fish. Though terrified, he studies them: "Their faces are white and skull-like, their eye sockets deep, cheekbones high, lips bloodless. They have long, fair hair, thin necks, slender wrists, claw-like fingers. And they're shaking. One of them has hands that shake" (translated by James Anderson). Bellori himself is so affected by what he sees that he spends the rest of his life studying the subject and takes six years to write On the Nature of Angels. On reading this far one may assume such a long novel would focus on Bellori's life and times, his struggle to publish an heretical thesis and to avoid burning at the stake. But no. The focus is instead a repetition of Bellori's investigation into the fundamental question: why have angels become mere animals, living in remote locations and avoiding contact with humans? "You've made it nice here," said his father, looking around. "It's good enough for me at any rate," said Cain. A shiver went through him. In Knausgaard's retelling, the space between a world with God and his angels and one without is recognised and felt in a manner that affects not only how we perceive the current world but how we perceive our perspective. Enthusiastic claims that "science fiction has emerged as the literature best able to articulate the relentless pace of social change" is faint mitigation when teleology is limited to this and the lives of characters in an exciting story. In A Time to Every Purpose Under Heaven, the presence and degradation of angels becomes a question of the absence of meaning in the modern world, an absence over which Knausgaard's writing keeps watch. In a coda to the novel, the narrator following up Bellori's thesis reveals himself to be a young Norwegian man called Henrik Vankel who has isolated himself on a small island after an unspecified breakdown on shore. He describes a relationship with his father in terms with which readers of My Struggle will be very familiar. He is also fascinated by Bellori's book and why, after many years of intense work, he suddenly abandoned writing. His speculative answer emerges from an unforgettable interpretation of Giottto's Lamentation as seen through Bellori's eyes. He saw what the death of Jesus meant for the angels in the painting. Christ never wrote, is an entry in one of Bellori's notebooks. It would have contravened the fundamental meaning of incarnation. The divine became a body: arms and legs, head and belly, heart and lungs. The divine lived in a specific place at a specific time. There was no universality about it, only a singularity. And that was where the meaning lay. That the meaning of Jesus' life lay in every single unique moment that he had been here was something churchmen didn't understand, they who had raised that bloody, crucified body into the language, and dissolved it in philosophy's abstractions. But the people understood. The hysterical medieval worship of relics was an expression of it: God was here, among us, like us. Not all the time, just once. And at that moment, when Pontius Pilate was procurator in Jerusalem and Augustus emperor in Rome, he'd set foot there, laid his head there, placed his hand there. In this passage we can appreciate Vankel's turn to solitude in nature and Knausgaard's need to write the six-volume My Struggle: gathering evidence of the divine, right here, right now. You write about Bellow's transformation from a minor to a major writer—“that readiness to follow where instinct seems to lead, which is perhaps what distinguishes the major from the minor writer”—Mr Pavone is similarly instinctual. He is earthy. From where do you date your own transformation? 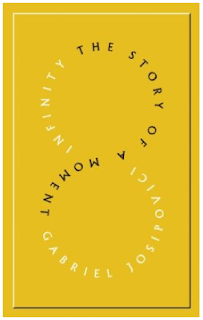 Jason Rotstein asks Gabriel Josipovici about this and his new novel Infinity: The Story of a Moment based on the life of the composer Giacinto Scelsi. My review of Infinity is now up.